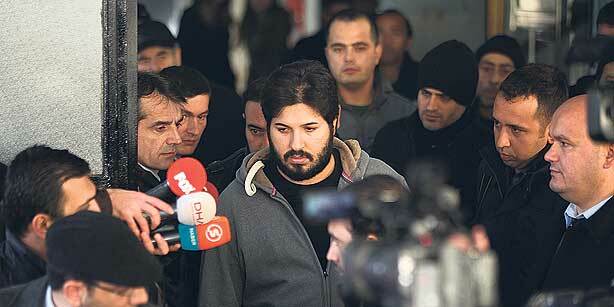 Reza Zerrab, an Iranian-Azeri businessman who is among those detained on Tuesday in an investigation of alleged bribery linked to public tenders, is accused of being involved in irregular money transactions, mostly from Iran, that total some 87 billion euros, sources from the İstanbul Police Department told Today’s Zaman. Zerrab has long been suspected of taking part in financial felonies. The Finance Ministry’s Financial Crimes Investigation Board (MASAK) submitted a report a couple of years ago to the İstanbul Police Department detailing transactions from abroad that indicated that Zerrab’s companies had participated in money transfers amounting to hundreds of millions of euros each without any actual corresponding trade. According to the information from the police source, who wishes to remain anonymous due to the sensitivity of the issue, Zerrab was also involved in irregularities related to the naturalization of some foreign citizens through covert deals and bribes with the sons of government ministers who were also taken into police custody on Tuesday. Based on a tip from an informant whose initials are reported to be A.M., Finance Ministry inspectors examined the activities and accounts of three fictitious companies established in Turkey and found that they were used to receive large sums of money transferred from Iran. Documents and testimony provided by this informant indicated that the amount of money laundered through transmissions to these companies’ accounts reached a staggering 87 billion euros between 2009 and 2012, mainly through Bank Mellat, 40 percent of which is owned by Iran. The inspectors formed a special commission to analyze the bank records of these companies in depth, companies founded by businessmen Adem Gelgeç and Vidadi Bedalov. A supplementary study by the investigatory unit found that there were a total of 11 companies involved in money laundering. On Feb. 25, 2013, Gelgeç was questioned by the inspectors and he eventually admitted that that the transfers were mainly from Iran and that the companies were actually founded to serve as bridges for money transfers. “I have a managerial position at İnci Kuyumculuk ve Dış Ticaret Ltd. Şti [a jewelry company]. As far as I remember, some transactions were conducted by some people like Ertuğrul Bozdoğan, Turgut Happani and Mete Alagöz through a delegation of authority,” Gelgeç reportedly said. He apparently added that the directives for the transactions were coming primarily from Iran and Azerbaijan, but he refused to provide any information about who gave these orders. It was later discovered that the orders to establish these companies originated with Zerrab. The beginning of the operation against the money laundering scheme dates back to Dec. 14, 2011, when three Azerbaijanis and an Iranian were caught with $14.5 million and 4 million euros in cash in their cases in Russia’s Vnukovo airport. The Russian Federal Customs Bureau reported the names of the couriers and demanded that the relevant money transfers be investigated. Consequently, 14 people, including the owner of a currency exchange office and his employees, were detained and they were later proven after questioning to have carried a total $40 million and 10 million euros in a total of 37 trips to Russia. The couriers divulged the names of the owners of the money in question, Nizami A. Surkhay H. and Vidali Badalov from Azerbaijan. The couriers were freed and an arrest warrant was issued for these three businessmen. As the investigations deepened, the Finance Ministry inspectors figured out that a number of precious mineral trading companies owned by Gelgeç and Badalov realized money transfers through the Turkish banks of Aktif Bank, Deniz Bank, Kuveyt Türk and Garanti Bankası through a long list of transactions including the names of the account owners that was 420 pages in total. The investigations revealed that each of the three companies sent an average of 5 million euros per day and that these transfers were one-sided, without any corresponding trade.